personalities involved such as Hugh Beaver Roberts, Charles Spooner and Moses Kellow, the entrepreneurial Croesor quarry manager. The book includes interviews with some of the people who latterly worked on the tramway and inclines. Significant parts of the tramway and the above ground parts of some of the quarries are still accessible to the well equipped and sure footed walker. 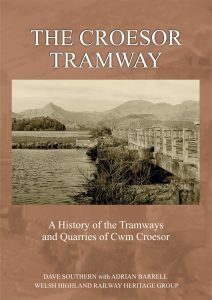 This book will therefore be of interest both to casual readers of social and industrial history as well as those wanting more detailed information on what can still be seen in the Croesor valley. The book comprises approximately 120 pages of text and is well illustrated with maps and photographs in colour and black and white including several published for the first time.